Are Your Interior Floors Getting Foot-Weary? Industrial flooring has it a bit worse. All those machines, forklifts scraping along the innocent concrete surface. And don't talk to me about skids and what they're doing to that poor floor! The constant daily wear and tear. Yes, that's definitely taking it to the point where you just can't ignore your hardworking industrial floor any longer. Restaurants, convenience stores, retail shops, office buildings - those floors have it easy. They have to be kept nice and shiny. It's the image, you know. Shine it up with a beautiful epoxy coating. Give it the look of faux granite. Embed your favorite emblems or your company logo onto a pristine gleaming surface. The possibilities are endless with our decorative coatings. Have fun choosing - and relax! Every Elite Garage NE® floor coating we sell is backed by a lifetime warranty that guarantees that the coating won’t peel, chip, or discolor. Our Polyurea and Polyaspartic products consistently outperform other floor coatings on the market. Call Us Today! Show Your Floors Some Love! 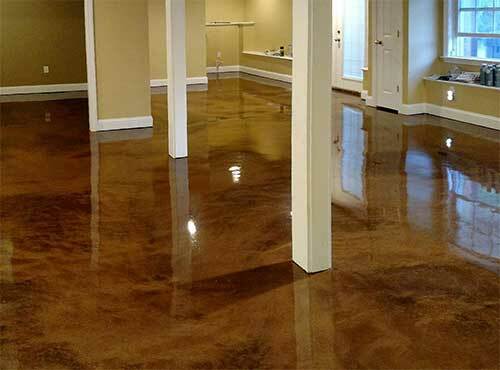 Choose metal illusion epoxing flooring for your interior floors.